‘Humbug’. The modern lexicon creatively being employed by the youth of today means it’s a word that sits on the milder end of the spectrum. Yet, tellingly, for many it retains a special power; it’s indelibly linked with one man and one situation. 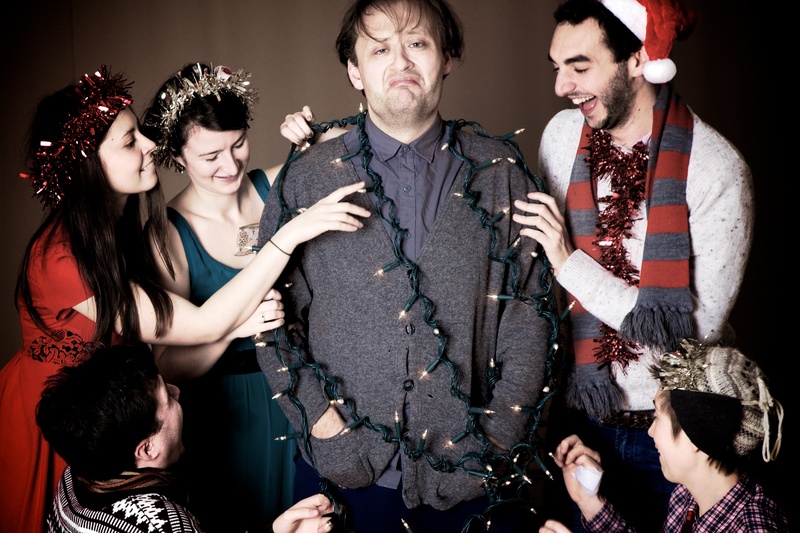 To tell someone they are a humbug is to accuse them of hating Christmas – a damning indictment indeed. Dickens’ story is so powerful that it has forced a character into their own existence. Scrooge. A creation so potent that his very name became synonymous with being a miser. It is a very simple story – of one man’s redemption over the course of one fantastical night – that has held a grip over the imagination since it was written. Each generation has their own favourite; whether it was read to them at Christmas, seeing Alistair Sims in black and white hunched around the TV or going to the cinema to watch the Muppets. 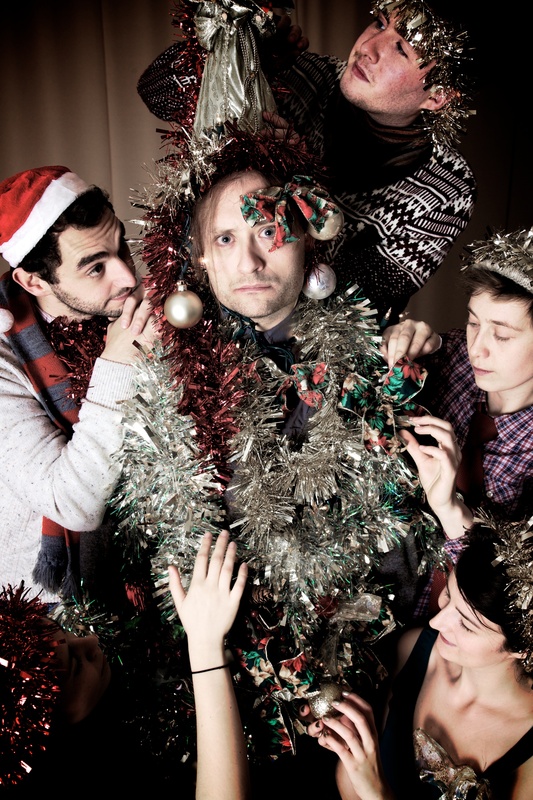 Metal Rabbit are one of three companies performing A Christmas Carol in London this winter. If you are after lashings of period detail then Antic Disposition’s version in the fabulous surroundings of Middle Temple Hall may be more to your preference, however Metal Rabbit provides a stripped down updating that consciously nods as much towards modern Britain as it does the slum-like conditions that Dickens captured so well. Alexander McMorran’s Scrooge is, quite literally, at the centre of this production; he spends much of the play standing centre-stage on a safe (that neatly doubles as a gravestone). It is an arresting opening image that is enhanced by McMorran rhythmically clinking a chain to hint at the miser counting his money but also inescapably leading the subconscious to the ticking of a clock that governs the passage of time over this fantastical night. It is also a neat trick to provide additional height for McMorran as it gives Scrooge the ability to physically look down on other people and enhances the sense of subservience of those around him. It is no surprise to see that director, Gus Miller, had previously directed The Picture of John Grey at the same venue as it was a production that shared a consideration of action that could take place on a vertical plane as well as the horizontal. In these fringe theatre venues a director needs to see all the possibilities of a limited space and Miller is proving himself adept at finding inventive solutions to the challenges of staging. A Christmas Carol require a number of different locations but it never falls over itself trying to recreate them. Places and items are brought to life through simple techniques – such as a wrapping paper turkey – and as a result it is remarkable fluid with the cast working hard to keep things moving. It is a young company and there are times when the cast feel slightly callow. Tonally some of the characters are all over the place and there feels a tension between Neil Bartlett’s desire to have created a play with a biting social commentary and the cast’s desire to showcase a heart-warming tale of human redemption. These are minor flaws and overall it was good to be reminded at this time of year, in a season that has become ever more ritualised around celebrating excess and gluttony, that the spectre of poverty (rebranded to the more politically sensitive ‘socio-economic deprivation ‘) is still with us and that one doesn’t need to travel far from the million pound Islington townhouses to find it.